Author’s Notes: Not much to say here except this chapter contains my favorite line from the story. I won’t tell you what it is . . . but it sure made me laugh! Just look for the italicized sentence. Deep in the heart of the castle was Zarack’s Imperial Throne Room. Sint and Thangar continued to fight, getting closer and closer to him. 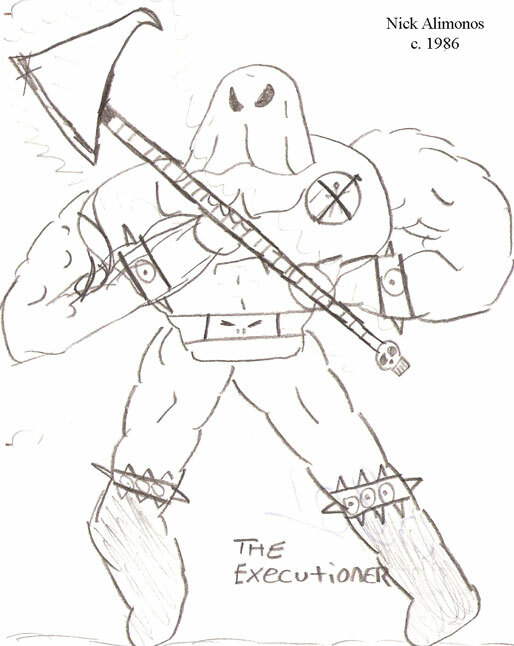 But Zarack had one more man to defend him: THE EXECUTIONER. Notice the logo on his shirt? Not a fan of stick figures, this guy. “Go and destroy mine enemies!” Zarack commanded and the Executioner took up his ax in search of Sint and Thangar. Meanwhile, Thangar rested, tending to Sint’s injuries from the arrow in his arm to his burned hand. But their safety was cut short. Out of the darkness, a voice broke the silence and a new enemy arose! Thangar turned to Sint, saying, “I’ll fight this battle . . . you stay here and rest.” He then got his sword and the two power weapons clashed like lightning. Both fighters blocked blows for a great length of time. Whoever tired first would die—and Thangar grew ever weaker from the weight of the ax. Suddenly, the Executioner made a lucky blow, slitting Thangar’s stomach! Too weak to fight, Thangar lowered his defenses. The Executioner did not finish the job, however, but picked him up and carried him away. Thangar looked for Sint, but Sint was gone! The Executioner took Thangar to the guillotine [original spelling: guiliteen] and set him up for a painless death. His ax was about to cut the rope to release the blade when suddenly, a brick flew into his head knocking him unconscious. Then the ax accidentally cut the rope! Thangar jumped forward, past the blade, and the Executioner fell into his place; the rest was too sickening to talk about. Thangar survived. He turned to see Sint, who had knocked out the Executioner, and was glad Sint hadn’t abandoned him . . . but saved his life.